One of my most favorite things about traveling is eating. Luckily, the friends I met loved eating too. And they didn't even think I was weird for taking pictures of the different things we ate. 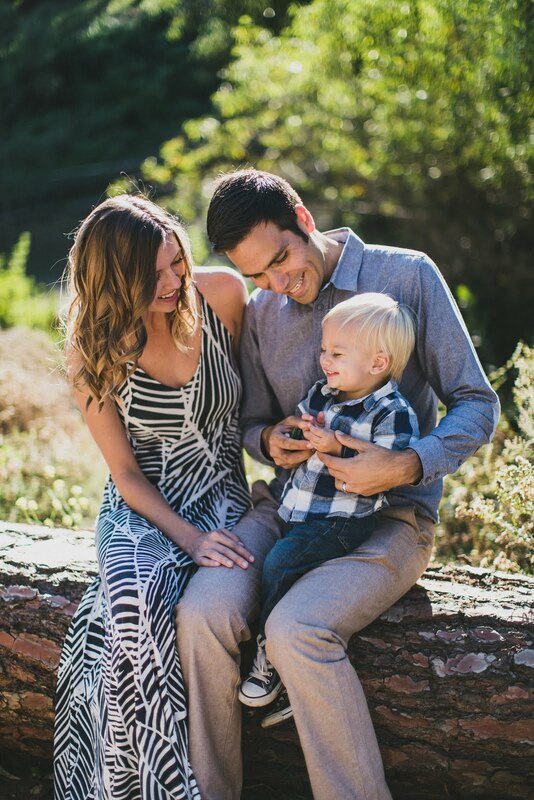 In fact, they took pictures too. One of my favorite things about food in so many cultures is how it draws people together, igniting and inspiring conversation and community. 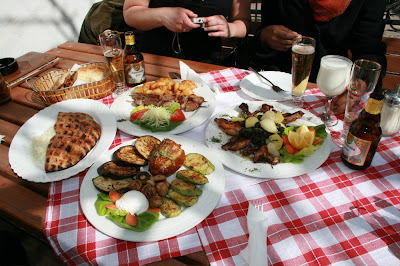 On the left is the most famous Bosnian dish I encountered called cevapcici, which consists of sausages in pita bread. It doesn't look or sound very appetizing, but let me tell you, it is delicious and I ate it many times during my travels. 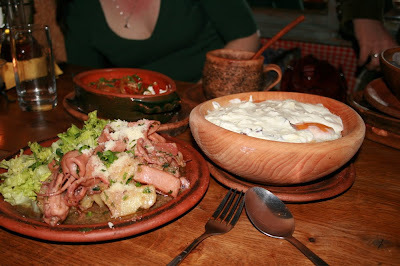 They also roast a lot of vegetables, serve a mean calamari, and cook a lot of meat. 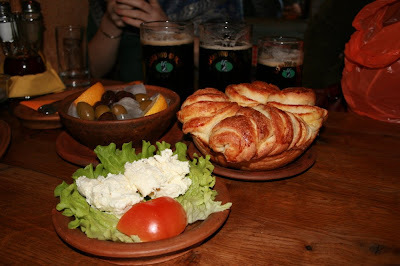 The beer is Sarajevsko, which is mainly served in a lager form. In this picture, you can see the darker version of Sarajevsko, quite unique and hard to find. On the right is delicious homemade bread. Also, some olives and a delicious cheese spread. Here is some roasted meat and veggies, more calamari, and pimento cheese and eggs. Here is Bosnian coffee. 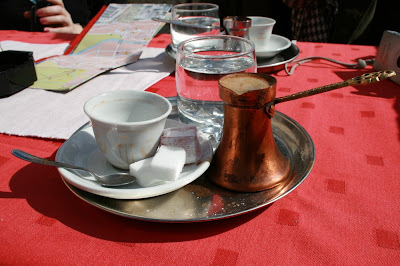 It is kind of like Turkish coffee, except served in Bosnia. It even comes with Turkish delight, which is very undelightful in my opinion. In Bosnia, relationships revolve around coffee. If a friend comes to your house, you serve coffee. If you are going to meet someone in public, you have coffee. I bought my own coffee set and coffee, so if you live near me, come on over and try some! 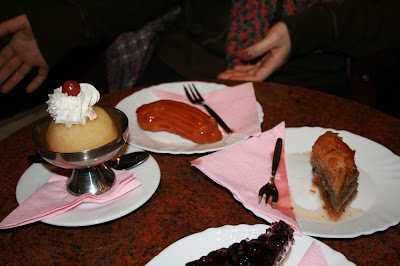 Here are popular Bosnian desserts. On the left is tufahijia, which is a baked apple filled with a type of walnut cream. Doesn't look or sound very appetizing, but surprisingly delicious. In the middle is some type of pastry. Then there is baklava, not my favorite, but traditional. 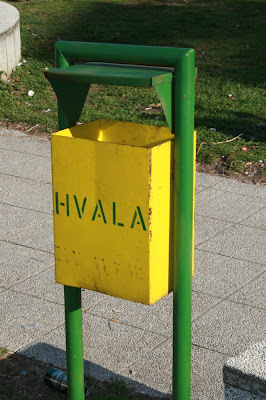 Hvala means thank you. 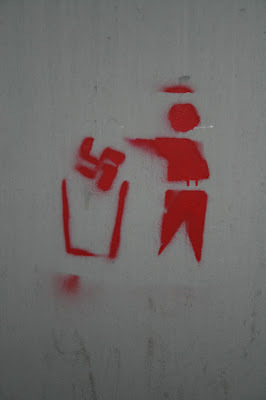 And in case you were wondering what to put in the trash can, in Bosnia, Nazi signs go in the trash: And this nice graffiti concludes my Bosnia travels. Now that my stomach is growling, I must go eat some food. nice conclusion to your bosnia blogs. very funny!! I commented as brooke, oops! But just to clarify, nazi signs do go in the trash can!! !